Ahhhhh . . . the first braise of the new year. Color me content. I had one last hunk of chuck roast in the freezer and it was calling to me, even though the temperature around here was more like early fall than winter at the time. But, we have had our first snow and the temperature is closer to where it should be, so I plan to be braising and stewing and souping quite a bit over the next couple of months. But while the meat is certainly a big attraction, I am still focused on my vegetable project, so I focused more on those for this braise. I usually cook the vegetables in the pot with the meat, but the meat is so big it leaves little room for a lot of vegetables, and they can get a little too tender for my taste. So this time I roasted the vegetables separately from the meat. It worked out ok, but not great. The meat cooks at 325 degrees, and the vegetables were taking too long at that temperature, and they were not caramelizing. After an hour and a half, I finally decided to put them in a baking dish, added a little vegetable stock, covered them with foil and baked them off. The end result is that they tasted good, and they had a little of that roasted flavor, but next time I think I will roast them before I put the meat in the oven, and then warm them up again just before I'm ready to serve them. I think that will make a big difference in the flavor. I braised the meat in a little bit of ketchup (homemade, of course), vegetable stock, and port. The only spice I used was fennel seed. To the vegetables I added some olive oil, dried rosemary, thyme and marjoram. The dumplings, from a recipe I found in Saveur magazine, are brightened up with fresh parsley. They absorbed the braising liquid, which wonderfully enhanced their flavor, but there was very little left over. I think that is more because I did not use as much as I should have in the first place than because of the dumplings. I did wonder as I was putting it into the oven if I shouldn't add more stock, but decided against it. Next time I will bring the liquid closer to the top of the meat, so I will be sure to have enough afterwards to sauce the vegetables. In case it is not obvious in the photo, the vegetables are carrots, fennel and rutabaga. I used garlic, onions, leeks and the fennel stems to braise the meat. I think that qualifies this dish for my vegetable project. I usually run out of vegetables before everything else; this time there was more than enough to last through the leftovers. All in all, a satisfying dish. 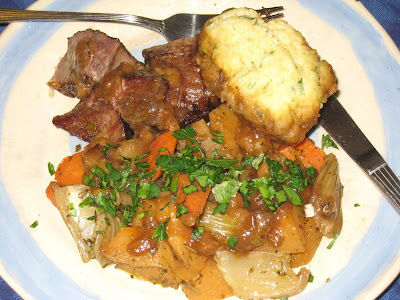 The vegetables were tender, but not mushy, and the dumplings provided a light component to the heaviness of the meat, which was fork-tender and rich with the flavors of the aromatics, ketchup and port. Preheat oven to 425 deg. F. Take the roast out of the refrigerator and let it come to room temperature, about 30 minutes. Layer a rimmed baking sheet with aluminum foil and place the meat on the dish. Season liberally with salt and pepper. Place in the oven and cook for about 15 minutes. least the 15 minutes that the meat is browning in the oven. Remove the meat from the oven and lower the temperature to 325 deg. F. Raise the heat under the dutch oven to medium high and push the aromatics around to the sides of the pot. Place the meat with the unbrowned side down into the middle of the pot and cook for about 3 minutes, until it has had a chance to brown. Add the bay leaves, the broth and the port and as much water as needed to reach about three-fourths up the sides of the meat. Bring to a boil, cover, and place in the oven. Cook for 1-1/2 to 2 hours, checking every half hour after the first hour to make sure the water level is good and it is not boiling. When the meat comes apart with a fork, it is ready. Remove it from the liquid and reduce the liquid on the stovetop until it has reached the desired consistency. Serve with root vegetables and dumplings.